What Are You Doing at 7:00? Keep that remote ready and prepare for one of the busiest Friday nights in Boston sports! The Bruins are trying to sweep the Flyers in Philly tonight, the Red Sox begin a 3-game series vs the Yanks, and the Celtics take on the Cavs at home in a critical game 3 matchup. When the Semifinal Round of the Stanley Cup Finals began, I was predicting the Bruins in 5. The Flyers are trying to prove me wrong apparently, and with their last performance on home ice, they seem to be throwing in the towel. I doubt that Philly will totally fold and they may get a gift if the Bruins decide to not show up and clinch it on home ice. If I were Julien I would pray the latter not happen. Playoff hockey requires such a heightened level of play and an intensity that drains a team. 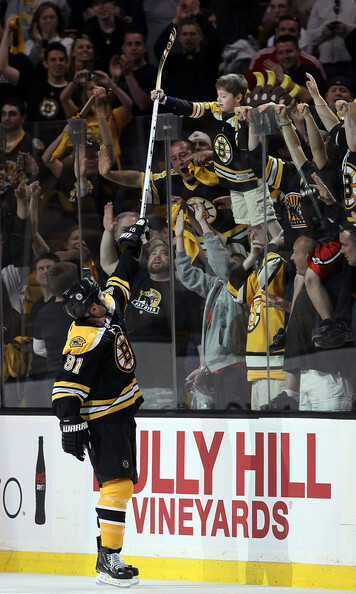 A win tonight would allow the B’s to rest their players, rest in which they desperately need. With yet another forward out for the playoffs, a win here would no doubt help Marc Savard in getting his legs underneath him. David Krejci will certainly be missed, however this team has shown that it can pick up the slack when someone goes down, but why couldn’t it have been Wideman? Granted Bouchere is no Ryan Miller, but the offense is executing much better in this series and Philly defense is, in my opinion, better than Buffalo’s, who hides behind its great shot blocker. 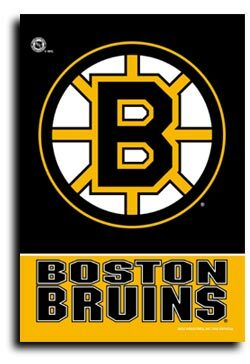 A loss tonight will in no way shape or form hurt Boston, but a win will be a tremendous advantage moving forward. 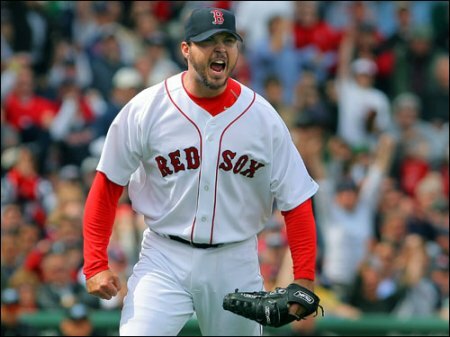 Will the real Josh Beckett please stand up? The Boston Red Sox have clawed their way back to .500. They are going into a 3-game series vs the New York Yankees and are in position to make up some key games early in the season. Beckett will face off against Phil Hughes who has a sub 1.5 era this season. As the “ace” of the staff, Beckett will need to put forth a solid effort and start this series on a good note. The offense has been starting to come around and starting pitching needs to follow suit. Game one is, on paper, the best matchup from a starting pitching standpoint. Sabathia squares off against Buckholtz, the most consistent starter to this point in the season, in game 2, and Burnett will face Jon Lester in game three. If the Sox can keep the bats swinging in this series they have the opportunity to pick up a lot of games in the division. After this series they will host the Blue Jays, and will face the Yanks again in a 2-game series the following week. The Tampa Bay Rays series at the end of the month could be for first place and would give the Sox a chance to start the summer on a high note. If I hear one more “elbow update” I might go mad! Tonight’s game for the Celtics is a great opportunity to keep the momentum in this series. The Celtics need to keep the pressure on the Cavs and they need to keep playing hard. The key to the game 2 victory was rebounding. The Celtics outrebounded the cavs 43-32. The key to game three in my opinion is the truth! 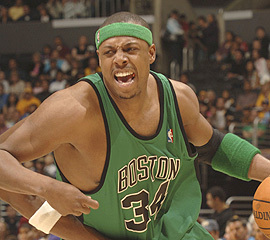 Paul Pierce has not been performing at a high level in this series to put it lightly. He needs to provide a little R&R to Rajon and Ray in game 3. Paul is shooting 33% from the field and 27% from beyond the arch. He has been careless with the ball and had some foul trouble last game. His scoring and rebounding are down this series and a big time performance in game 3 could be just what tis team needs to take control of this series. Look for Rasheed to get some more time in this game after his 7-8 shooting performance in game 2. Sheed was able to pick up the slack last game, and if he can become a fraction of the player he was during Detroit’s playoff prowess, it would free up Ray Allen on the edge and provide more passing lanes so KG and Perk can go to work inside. I would really love to see the Celtics take after their coaches personality when he played for the Knicks. If Lebron were playing in the 80’s against the Celtics or the Knicks, and especially the Pistons, you can bet he would be knocked down every time he came into the lane. With the excessive whistles in Cleveland this was obviously not possible, but I would love to see James taste some parque’ tonight. My attention will most certainly be on the basketball game because the Bruins will eventually win this series and I will be able to watch the baseball game after the Celts’. This is either going to be a great start to the weekend, or a bike ride with no seat. After being swept today against the Tampa Bay Rays, the Red Sox have started their 2010 season by posting a 4-9 record, 1-7 against the AL East. No one that says they are a Red Sox fan expected this team to be four games under .500 so early in the season, but it has happened. 1) John Lackey – we expected Lackey to come to this team, slide into the 3 spot in the rotation, and become the best ace to pitch from that spot in any rotation in the history of baseball. The problem is that from the number 3 spot Lackey has been our ace (barring Josh Beckett’s last start against the Rays which ended in a 3-1 loss in 12 innings, but we will get to that later.) In 2 starts Lackey has respectably thrown 12.2 IP, only surrendering 10 hits and 2 ER in those 2 starts. So far Lackey is everything we expected to get, and could possibly be more dominant once Lester stops pitching in April. 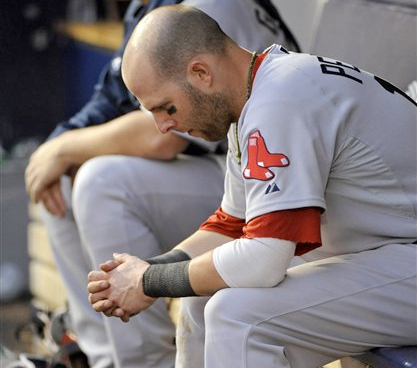 2) Dustin Pedroia – .367 BA, 5 HR, 13 RBI, .404 OBP, .755 Slugging in 12 games (thank you ESPN). Dustin will always be Dustin for years to come. 1) John Lackey – then he faced the Rays. 3) Pitching – it seems, from my perspective, that when the offense for the Red Sox manages to squeeze out a few runs, the starting pitching decides they do not want the run support and choose to hand a few, if not all of the runs back to the team they are playing. Clay Bucholz was handed a 4-0 lead in the first inning last Sunday against the Royals in Kansas City. At the end of the 3rd it was 5-3 lead. The Red Sox managed to squeeze out, yes squeeze out, an 8-6 win. My question is, when are the Red Sox starting pitchers going to wake up and recognize that having a lead IS A GOOD THING? They should try their best to keep it intact. 4) Offense – in 12 games the Red Sox are 7th in team batting average…that is not a typo…7th. Watching the games you realize why this hitting has not equalled wins. They do not hit with runners in scoring positions. Based on what happens tonight the Boston Red Sox could be only one game better than the Baltimore Orioles…that is not acceptable at any point in the season.